Hollybeary Creations : Sunday Stamps & a Little MoJo! Sunday Stamps & a Little MoJo! So, I'm really behind again on my DT projects.. But there's still time to play along with us at Sunday Stamps.. 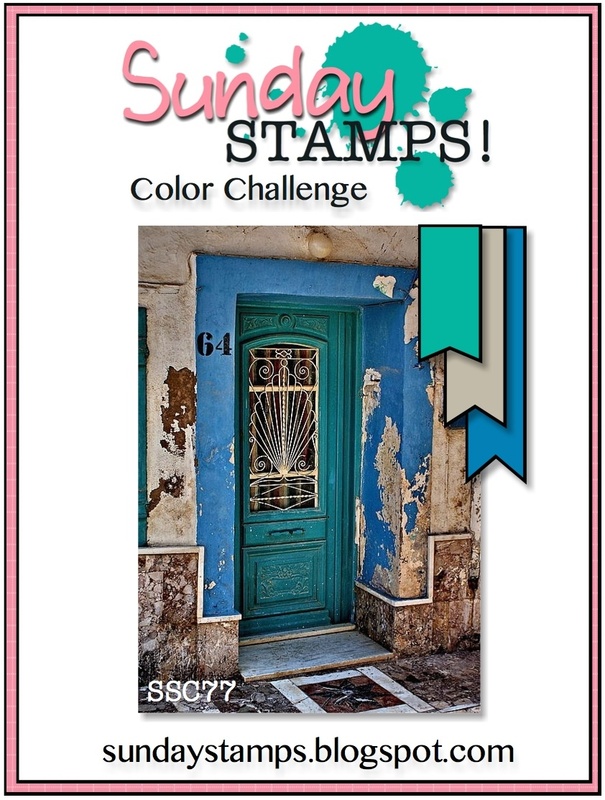 This week have a fabulous color challenge using Bermuda Bay, Sahara Sand & Pacific Point. And when I saw this great sketch from MoJo Monday I had to use them together! I'm still in need of Birthday Cards.. I've been trying to send a card to all of my friends this year. It's been tricky and some have been late but almost everyone has received a card so far!! And who doesn't love to get something in the mail besides a Bill. My card base is Pacific Point and I added a layer of Sahara Sand & the same color DSP. Then I added a piece of Bermuda Bay that I stamped with the Gorgeous Grunge set. I stamped the sentiment from Remembering your Birthday in Pacific Point onto a piece of Sahara Sand. This cupcake is from Create a Cupcake... this set is now retired but I love it! You can't really see in the photo but I added some Wink of Stella clear on the heart & bow. I punched out a 2 1/2" circle from Whisper White an added some splatter from Gorgeous Grunge in Pacific Point and added some paper piercing around the circle. Then I added the cupcake with dimensionals. I think this could be a Male or Female card with the colors. 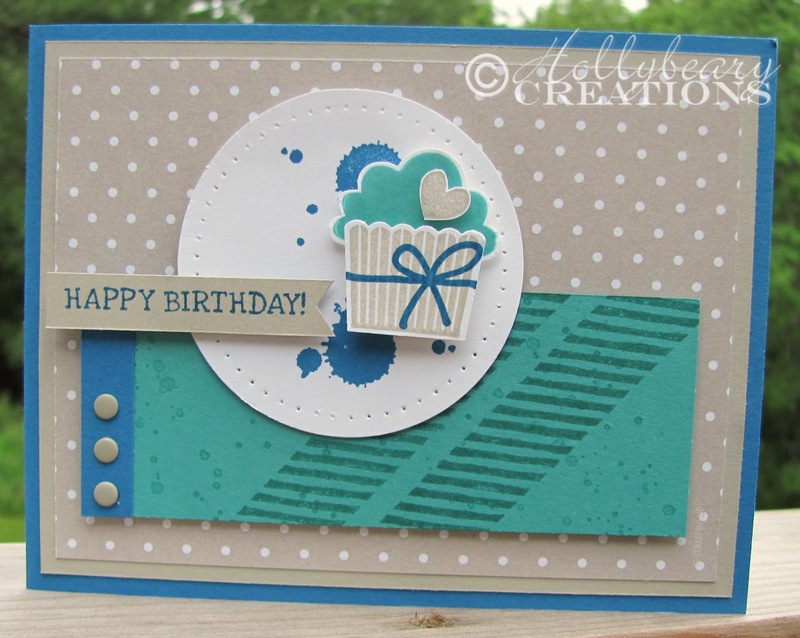 Head over to the Sunday Stamps challenge and see what the other Design Team members created with this color combo.. The challenge is open until Friday @ 6pm EST. The MoJo Monday Sketches never ends so you have lots of time to play along but they will lose the Linky on June 15th. I love the little heart and all of the patterns on your card, Holly. It's really cute! 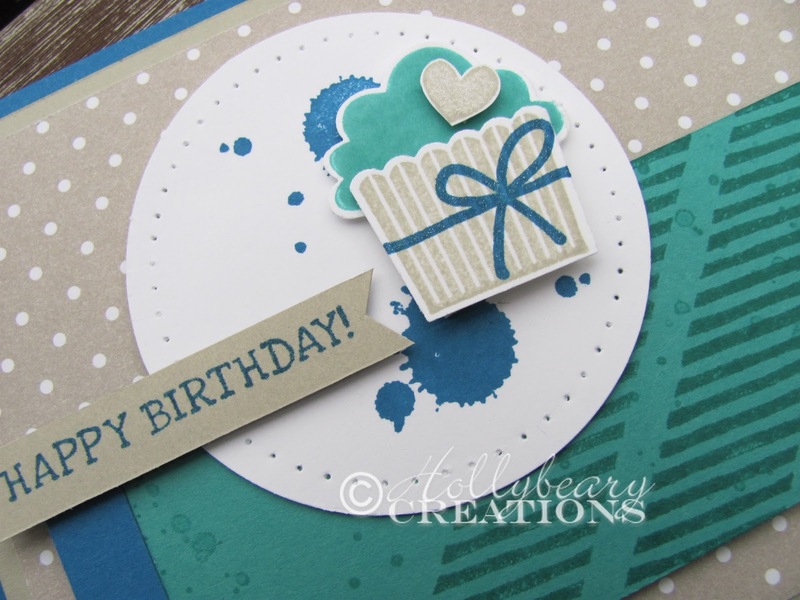 Neat card- I like the color combinations and the that cute cupcake! Glad to have found you through the Mojo Monday linky. I love this card. The colors are great and the multiple techniques! Fantastic!